This blog post briefly introduces the Security Dialogue Special Issue on Militarism and Security: Dialogue, Possibilities and Limits, guest edited by Anna Stavrianakis and Maria Stern (Volume 49, Issue 1-2, February-April 2018). Here they talk about their own article for the special issue, which also serves as its introduction. 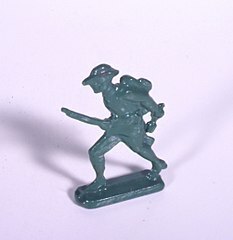 If your child comes home from school and tells you they participated in an obstacle course with some soldiers in P.E. class, should you be worried that their education is being militarized, pleased that they are learning physical skills and discipline, or both? If soldiers are digging wells and providing medical care in the Sahel as part of Operation Barkhane, is the region experiencing a purely military intervention against crime and terror, or is the population also being rendered more secure? When the Indian Army takes youths from Jammu and Kashmir on educational and national integration tours, are they being exposed to new opportunities to learn about their country’s heritage and contribute to its development, or mobilized into a military legitimation campaign? If a nation’s critical infrastructure is crucial to the security of the population, what does it mean for the Trump administration to threaten nuclear first-use in response to cyber-attacks? Now, security seems to be everywhere and nowhere, as well as always and never; and attaining security dominates news cycles, persists as a primary concern and impetus for policy, and pervades our lives and choices. These questions, and the many more that can be taken from a glance at the news from anywhere around the world, prompt considerations about militarism, about security, and about their interrelationships. They invite us to think about how we are to make sense of organized violence, and of seemingly non-violent attempts at ensuring social order and keeping safe what we value, as well as the way these efforts complement, contradict or transform each other. During the Cold War, militarism was a key concept through which we considered such interrelationships – either in terms of the military-industrial complex, repeated military coups in the global South and the claim of state security, or superpower nuclear rivalry. In the 1990s, the concept of security took precedence in both academia and in the world of policy, and focused on a broader range of threats and a different set of responses, culminating in the current global efforts to fight terrorism. 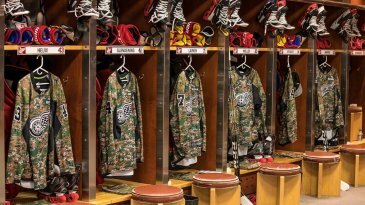 The NHL’s Detroit Red Wings’ “Salute To Service” jerseys. Now, security seems to be everywhere and nowhere, as well as always and never; and attaining security dominates news cycles, persists as a primary concern and impetus for policy, and pervades our lives and choices. Yet despite this shift seemingly away from militarism and towards an expanded notion of security, the coercive element inherent to militarism never went away; and with the invasions of Iraq and Afghanistan, militarism – broadly understood as as the preparation for war, its normalization and legitimation – was back on the global security agenda. Developments in scholarship reflect these shifts. We have seen how Critical Security Studies as a field has flourished and how ideas central to its original critique, such as securitization and the importance of gender, have been adopted in the mainstream agenda. Recently, new critical projects, such as Critical Military Studies and Critical War Studies, have focused specifically on militarism and war. Aside from feminist scholarship, a puzzling divergence in the conversations has emerged, between security on the one hand, and militarism on the other. Given the way that the ideas, practices and methods that are understood as security or militarism shift and slide historically and in terms of contemporary politics and academic inquiry, why and how does it matter what we label them, and how are we to study them? In our introductory article for this Special Issue, we argue for a reinvigorated conversation about security, militarism and their interrelationship, given that their meanings are never settled, and that current critical scholarship already creatively addresses both concepts and practices in productive and eclectic ways. Yet, we also underscore that despite the all too present move towards security in both critical scholarship and more traditional policy circles, we do need to keep talking about militarism; but also that the old ways will not suffice. We need to pay attention to our conceptual vocabulary and our methodological tools because of the racialised, classed and gendered practices of militarism and security; the ongoing challenge of Eurocentrism and methodological nationalism in intellectual knowledge production; the paradoxical role of the state in organised violence; the spectrum that links intimate partner violence to state military violence; and the ways in which militarism and security (as concepts, practices and even as method or goal) shape each other. It is the mutual relationship between militarism and security – at times reinforcing, at others transforming, and occasionally weakening – that academics need to keep on studying.